American yard Viking Yachts has released a behind-the-scenes video, which shows the progress of the first hull in the Viking 93 motor yacht series. As the footage shows, the wheelhouse was recently attached to the GRP hull at the yard’s Gretna facility. The launch of this 28.45 metre yacht is planned for August 2017. This in-house design features a fast planing hull and builds on the success of the yard’s existing Viking 75 and Viking 82 series. 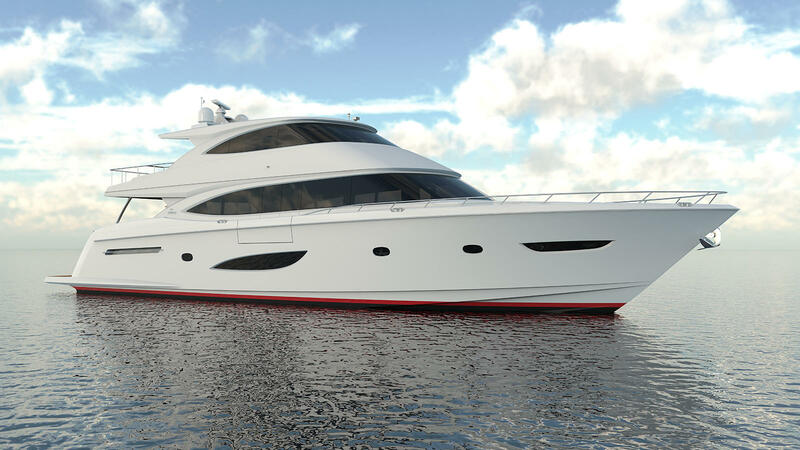 While the Viking 82 was based on an extended version of the Viking 75 hull, the Viking 93 is an entirely new project for the yard. This tri-deck motor yacht features a beam of 7.38 metres and a maximum draft of 1.8 metres, while the enclosed skylounge provides a sheltered observation area. Further details are being kept under wraps for now, with the layout and accommodation still open to customisation, but the engine set-up has been confirmed. Power will come from a pair of 1,920hp MTU V12 2000 M96Ls, which Viking estimates will propel the 93 motor yacht to a top speed of just under 27 knots and a cruising speed of around 24 knots. The American yard added that it plans to showcase the first Viking 93 motor yacht at the 2017 Fort Lauderdale International Boat Show. Other projects currently under development at the American yard include the first Viking 82 Motor Yacht, which was recently launched. Viking plans to launch a grand total of 17 yachts measuring more than 24 metres LOA in 2017, including nine hulls in its popular 92 sportsfish series and the tenth hull in the Viking 80 series, Friendship, which is due to go on display at the 2017 Palm Beach International Boat Show.